A burly key forward who made a big impact at Victoria Park when he finished runner up in the Copeland Trophy in his first season on the list. Having made his name with Fitzroy and later Brisbane, Molloy was a solidly built player who made life easier for those around him with his physical approach and determination to do the team things. After attaining cult status with the Lions in 1999, Molloy played all 24 games the following year but lacked the impact he’d had previously and was traded to Collingwood in exchange for Mal Michael. A debutant at 17, Molloy was an old 24, in football terms, when he joined the Magpies and immediately added leadership and grunt to a team that was rapidly regenerating. In an odd twist of fate, his move to Collingwood was a form of returning home as he had sold Football Records at Victoria Park as a youngster. In the lead-up to the 2001 season he lost a massive 10 kilograms, and his hard-hitting, crash through style in the forward line gave an extra dimension to the Magpie attack and provided the perfect foil for Chris Tarrant and Anthony Rocca. He ran second in the best and fairest count, starting the year with three goals on a hot March afternoon against Hawthorn and was a consistent contributor throughout the year. He was robbed of a Mark of the Year contender mid-way through the year when he took a hanger over Sydney’s Andrew Dunkley, only for teammate Anthony Rocca to infringe for a push in the back. Dunkley had to be assisted from the field after Molloy had landed heavily on him. 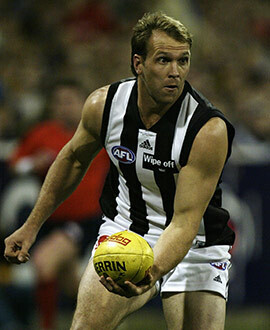 Hamstring, foot and knee injuries decimated his 2002 season, reducing him to just seven games. He made a brief impact against his old club in round eight but played just twice more before being recalled on the eve of the finals. Molloy won just three disposals in the Qualifying Final and, despite his status as vice-captain, was omitted for the Preliminary Final. Jason Cloke’s suspension paved the way for his return on Grand Final day, but he struggled with limited game time, winning just the one kick and laying two tackles. Molloy hit back in 2003, playing all bar one of the first 21 games in the senior side. He sparked the team after a mid-season lull, kicking 3.3 against the Bulldogs in the first week after the bye. The Magpies lost just twice more for the year. His final starring role was played under the lights at the MCG on a Friday night against Richmond in round 16 when he kicked four goals, took nine marks and won 23 disposals in a 69-point win. Molloy lost his place just before the finals, appearing for one last time in wet conditions against Sydney in round 21. His battering ram style had taken its toll and although he was an emergency for the Grand Final, he retired at the end of the year aged 27. In retirement, Molloy worked in television and radio commentary and coached locally.